Lanark-born Robert Scott is mentioned in Herbert Bushnell’s Dictionary as ‘a great Scottish engraver’. He began his training as an engraver under Alexander Robertson at the age of eleven, and then enrolled into the Trustees’ Academy where he studied with David Allan. Robert Scott was a talented draughtsman, and yet his opinion of artists who turned their life to painting was that they were wasting their time, which is why he decided to focus on engraving – an altogether more economically profitable career. He ran his own business in Edinburgh, had many assistants, and “had the equipment for copperplate-engraving, etching, mezzotinting, aquatinting, and lithography and also introduced to Edinburgh the art of engraving on steel” (Lucy Dixon, Oxford Dictionary of National Biography, s.v. “Robert Scott”). He was best known for his landscapes, but also provided illustrations for the works of British poets, travel books, magazines etc. In 1807 Robert lost four children within days of one another. Two of his sons though lived on to become well-known artists: David Scott and William Bell Scott. Understandably given Robert’s training, many of his works are after David Allan. The two also collaborated for George Thomson’s publication, and produced the illustration for ‘The Battle of Killiecrankie’. 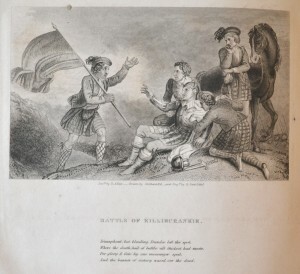 The present image comes from a bound collection of Thomson illustrations. The image was designed by David Allan, drawn by Thomas Stothard, and engraved by Scott. 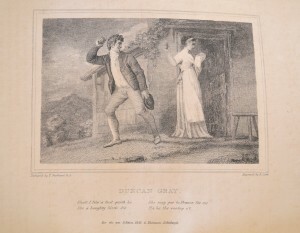 Robert Scott also features in works for Thomson without his maestro David Allan, as is the case for ‘Duncan Gray’ which he engraved from a design by Thomas Stothard. There are two versions of the illustration for ‘Duncan Gray’ illustrations: one was engraved by Robert, and the other by David Scott, his son. They are virtually identical. Robert’s engraving appears in an octavo volume and an inscription at the bottom of the page informs us that it is “For the new Edition 1838”. As far as we have traced, Thomson’s set of octavo volumes first appeared in 1822-3 and again in 1825 (with a final sixth volume). But copies with dates as late as 1838 have been located.